"Of Days Gone By". This is one of two images I created of the working steam locomotive that still runs today through the Pennsylvania countryside. Located in Strasburg, PA, adjacent to the Railroad Museum of Pennsylvania, Engine 475 is now in service simply as a tourist attraction. It runs numerous times daily along a route through the Amish country near Lancaster. The scenic route takes you past working farms and now-defunct industrial buildings which were formerly served by this rail road. The image was captured using a Fuji X-T1 mirrorless camera fitted with an 18-55MM f2.8 Fujinon zoom lens. I visited the area on a motorcycle road trip in late summer 2015. After taking the tourist ride on the train I spotted a few spots along it’s route where I knew I could set up to capture the train underway. I returned to a number of these spots over the next few hours and captured different views of the train from different sides of the track at three different locations. Elsewhere in this gallery you will find another image of engine 475 as it pulls it’s vintage, restored railway cars through the Pennsylvania Dutch countryside. For an old-fashioned, vintage look I post processed this image in an appropriate sepia tone. 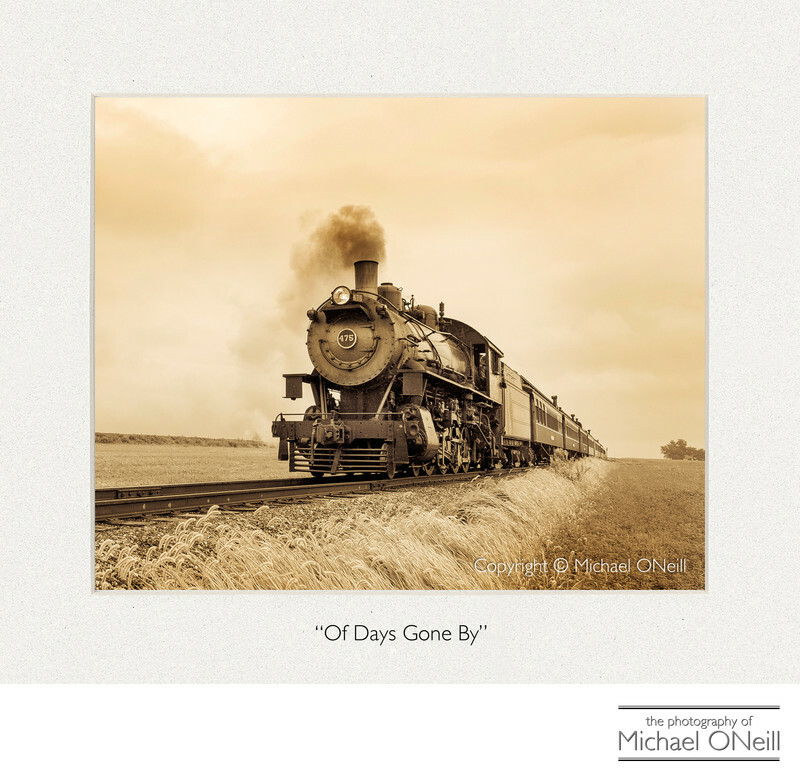 "Of Days Gone By" can be acquired by interested collectors by following the contact links on this web site or by visiting the various fine art photography galleries that offer my works.